While being unemployed and evicted from your apartment may seem like the end of the world, it was only the beginning for a young witch who may or may not have been the cause of her aunt's death. Of course, her aunt's death did lead to a wonderful surprise - a beautiful cabin in the woods of Wisconsin. The only downside? 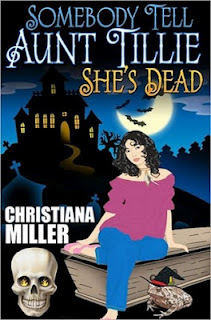 The ghost of her Aunt Tillie is trying to kill her before the devil gets hold of her. I was immediately drawn into Somebody Tell Aunt Tillie She's Dead by the main character, Mara, a young witch who was down on her luck. I think her character is one that many women can connect with because we've all been in a situation that we thought couldn't get any worse, but did. Because Mara was so lovable, I found the book hard to put down, but there were areas of the book I had a hard time swallowing. It's important to note that this book does contain sexual scenes, some of which are of a homo-graphic nature, and does discuss many Wiccan rituals. However, I didn't have a problem with the Wiccan nature of this book at all, even though I'm a devoted Christian. In fact, I found the book very enjoyable and can't wait to read more about Mara, Gus and her ghostly family. I highly recommend Somebody Tell Aunt Tillie She's Dead and give it 5 out of 5 stars. If you love paranormal romance, you will love this book! This was a book that I managed to grab for free during a promotion on Amazon. However, the book is very affordable with the regular price being only $3.99. Of course, if you have Amazon Prime, you can borrow Somebody Tell Aunt Tillie She's Dead for free from the lending library. Free kindle books are my crack and you have become my dealer!